100 years after the design of HMS Hermes – the world’s first aircraft carrier – F-35 stealth jets will take off from another record breaker this autumn. 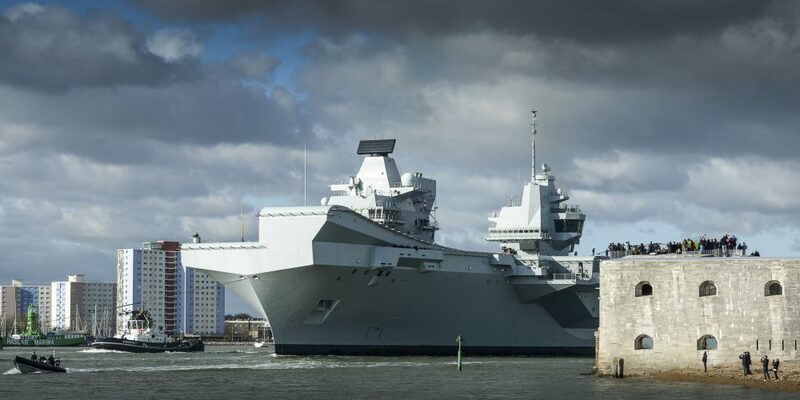 Weighing in at 65,000-tonnes, HMS Queen Elizabeth is longer than the Houses of Parliament and her flight deck could accommodate three football pitches; she is the biggest warships ever built for the Royal Navy. Still under construction, the second of the Queen Elizabeth class carriers, HMS Prince of Wales will enter active service from 2020. HMS Queen Elizabeth sailing from her home in Portsmouth for the first time. A BBC news article The UK’s Giant Aircraft Carriers illustrates a century of extraordinary shipbuilding and explains some of the many advanced features of Britain’s new carriers. Perhaps the most distinctive aspect are the twin islands and especially the aft island which takes the form of a flight control tower. Dubbed the “Flyco”, the innovative air traffic control room was designed and manufactured by Tex Special Projects. Subsidiaries of UK manufacturing group Tex Holdings, Tex Special Projects and Tex ATC specialise in radio frequency-blocking glazing for both civilian and military applications and the design and manufacture of air traffic control rooms. Clients include BAE Systems, Defence Infrastructure Organisation, Feka, Morgan Sindall, NATS and Thales. Tex ATC have been employed as consultants on numerous air traffic control room projects including Manchester Airport (UK), Mina Mussafah Harbour, Abu Dhabi (UAE), Muscat International Airport (Oman), RAFO Thumrait (Oman) and Suvarnabhumi Bangkok International Airport (Thailand).